A shingles rash is not something you soon forget, is it? Anyone who has experienced shingles understands the pain, discomfort, and frustration that goes along with this skin malady. Thankfully, there are ways to treat shingles skin rash. The symptoms associated with the onset of shingles can be mistaken for other illnesses until the rash appears; after which time, it's usually pretty clear what you have. It's important to allow your physician to see you if you have any symptoms such as headache, body chills, fever, deep fatigue, an all-over body ache, or painful sensations on the body. What is Shingles Skin Rash and What Causes It? Did you have chicken pox as a child or as an adult? The Varicella-Zoster virus is the virus that not only causes chicken pox, but shingles as well. Once someone has had chicken pox, the virus remains dormant in the body within the nervous system. Not everyone who has had chicken pox will get shingles, but it's one indicator that could point to shingles if you are experiencing the symptoms outlined above. Children and adults both can get a shingles rash, but it's mostly seen in people with compromised immune systems and elderly adults. Repeated infections or attacks on the body's immune system can lower its ability to fight infection and sometimes when that occurs, the dormant Varicella-Zoster virus emerges from the nervous system and attacks the body. Just a note: the virus that causes genital herpes is called Herpes-Zoster and is not the same one that causes shingles or chicken pox. The two herpes viruses are often mistaken. The rash can appear on your face, arms, or in your eyes, but most likely appears in a stripe-like pattern somewhere on your torso. Before the rash appears however, you may experience a tingling sensation, numbness, burning sensation, tenderness, or painful sensations on an area of your body. At times, for some people, random stabs of pain will go through the affected area of the body in addition to the other sensations. A few days after the pain appears, a red rash combined with red blisters filled with fluid will likely show up on your skin. This area could be itchy and will, unfortunately, continue to be painful. At first glance, shingles blisters may look like hives, but they're different in that they are filled with fluid, will break open periodically, and then scab over. How Long Will Shingles Rash Last? Shingles can last a month or several months for some people, depending on how much the immune system has been compromised. Age and stress level can prolong a case of shingles. 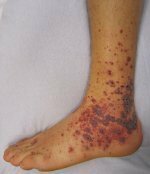 Every virus is accompanied by potential complications and shingles is no different. Some people experience scarring where the lesions finally healed. Blisters that aren't cleaned or cared for properly can get infected and develop other medical complications. Nerve damage is possible when shingles occur in the facial area and can cause loss of hearing, sight, or balance. Some people even experience inflammation in the brain, which can be very serious. In some cases, the pain associated with shingles can go on long after the actual blisters have healed. This condition is called postherpetic neuralgia. How is Shingles Skin Rash Treated? Once the virus has been identified as shingles, several treatments could be recommended or prescribed by your doctor. Acupuncture is a Chinese medical treatment that has brought great relief to those suffering with shingles. Acupuncture and related Traditional Chinese Medical techniques such as Chinese Herbs and cupping have been highly successful in providing quicker healing of the rash and, even more importantly, relieving the pain that comes with shingles. Daily treatments are optimal. Give your immune system a boost by eating foods high in Vitamin C, Vitamin E, zinc, selenium, bioflavenoids, carotenoids, and Omega 3 fatty acids. The good news is that eating fresh fruits and vegetables, fish, whole grains, brown rice, chicken and garlic are great foods to get what you need to give your immune system fighting power. To alleviate pain of blisters - some people find relief from applying a paste made from 2 T rubbing alcohol and 2 crushed aspirin, however this may be too strong for many people with sensitive skin. Enduring a shingles rash isn't an enjoyable experience, but there are ways to get through it using natural remedies, rest, and relaxation.